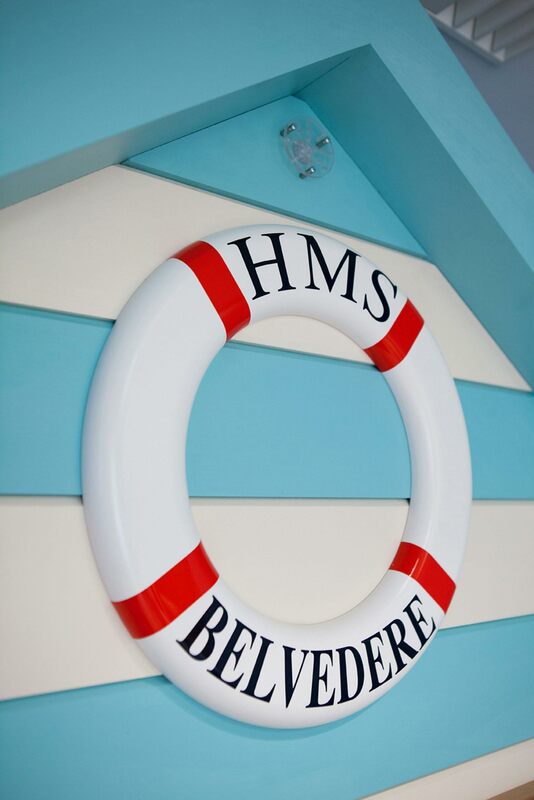 Belvedere ward, Franklyn Hospital Exeter is a 16-bedded assessment and treatment unit for people with moderate to severe dementia. 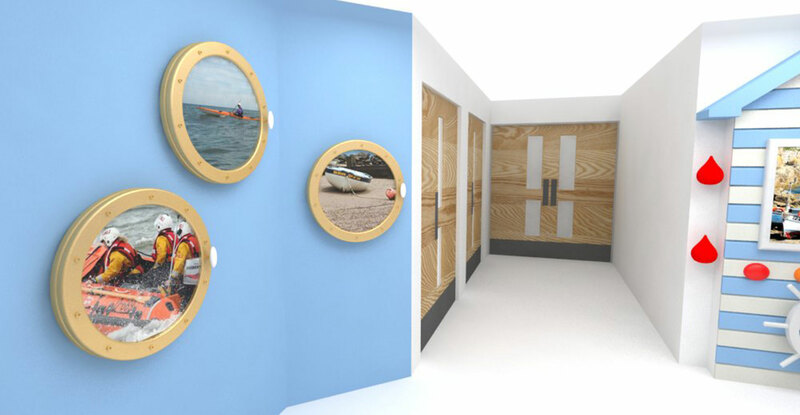 Working with the Renatus manufacturing company, we designed new layouts, furniture and interiors for the communal areas using dementia design research to enhance the wellbeing of patients, staff and visitors alike. 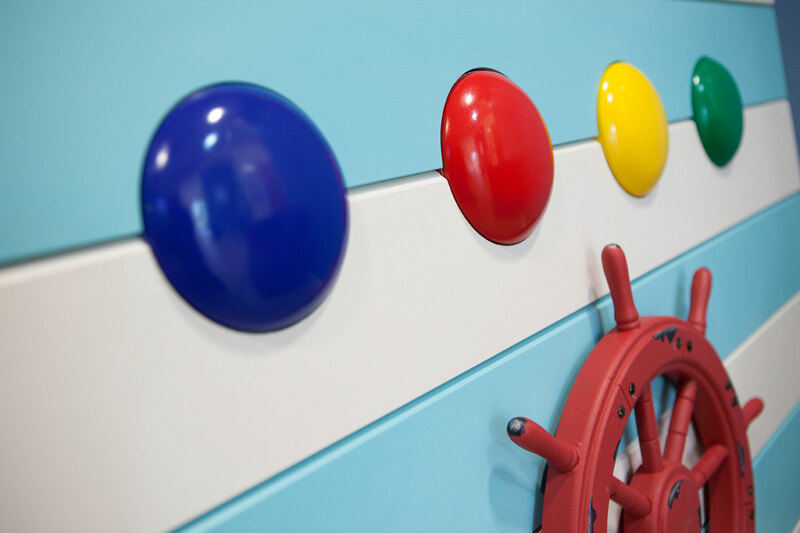 The ward was originally designed around ‘sensory trails’ that connected the indoor and outdoor spaces based on the themes of coast, country and moorland. 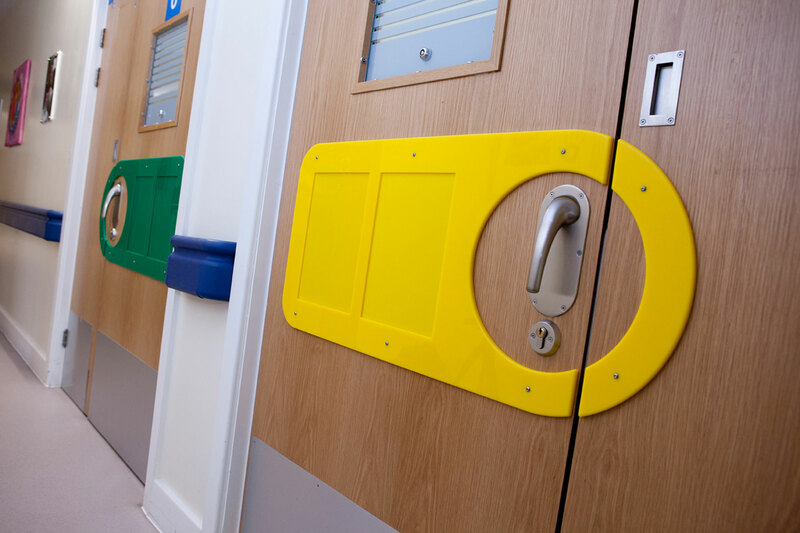 However because the ward was designed in a loop, there were key areas that patients would naturally gravitate towards, leaving others either underutilised and hard to navigate. Dementia patients often use visual cues to orientate themselves when they feel confused. If they are unable to easily comprehend the use of the space they may not use it, or become distressed as they feel lost. 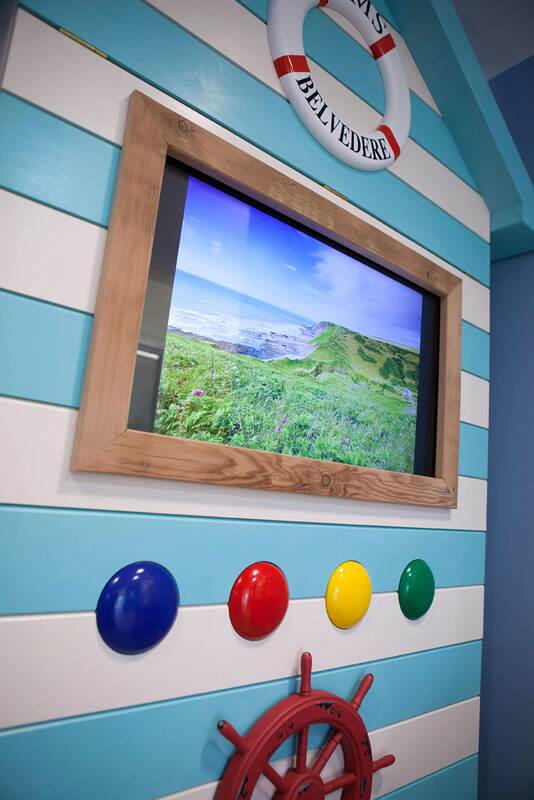 Television can become the sole focus in a lounge area which although a welcome diversion, can inhibit social interactions between patients, visitors and staff. We identified that there was a need for different areas within the communal room, subdividing the space to form two distinct areas – a kitchen activity area and a lounge area. 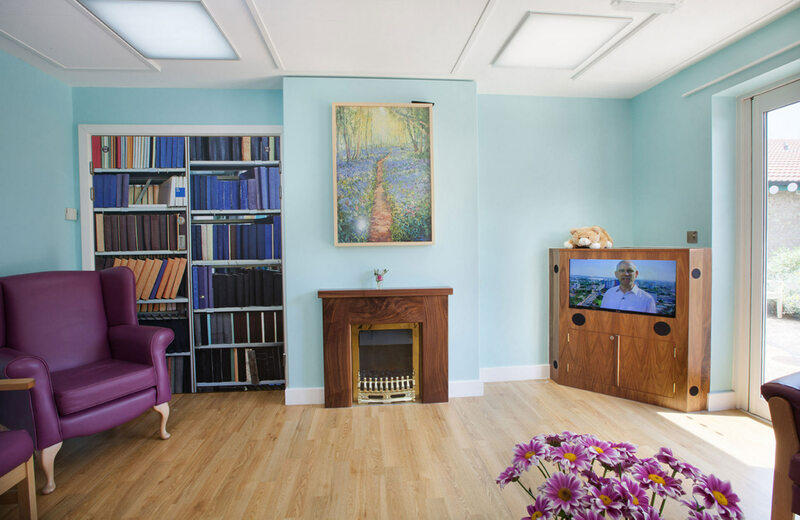 The overall colour palette was natural blues and greens, to encourage a calming atmosphere, with furniture picked out in solid contrasting colours to support the independent movement of patients suffering with confusion and the visually impaired. We created a domestic feel to both spaces, to enhance the feeling that this was a safe and comfortable place to relax. In the lounge area, ‘lounge-style’ furniture was positioned into clearly defined social areas. The TV was housed in a cabinet with built-in speakers and doors that discreetly covered the screen when not in use. 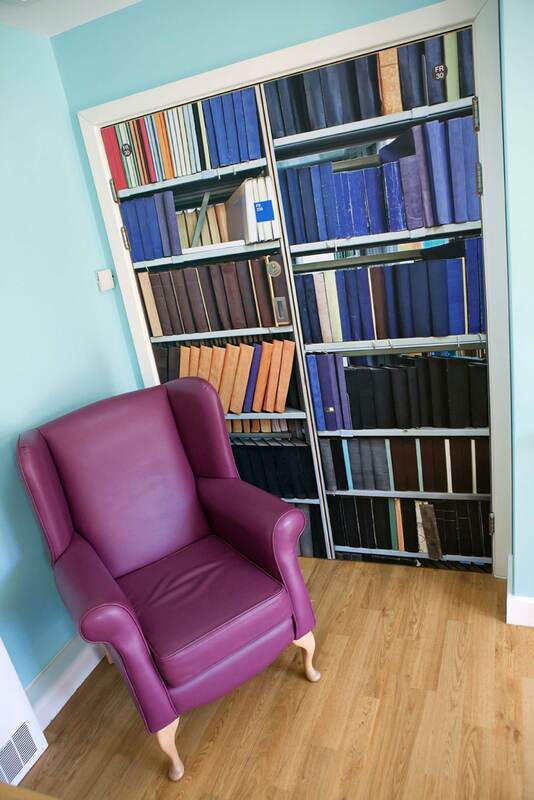 A door to a storage area, that was not for use by patients, was camouflaged by bookcase graphics enhancing the lounge-like feel but also reducing frustration by the belief it was an exit door. 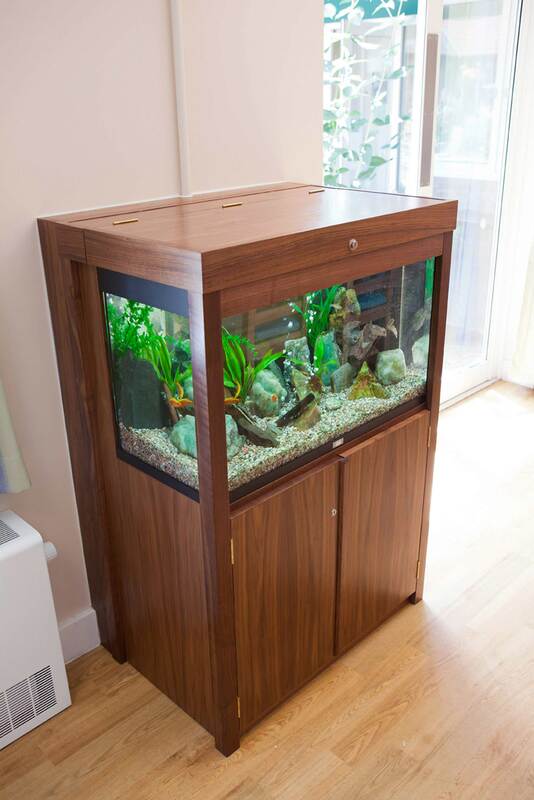 A fish tank added another calming focal point to the room. The kitchen activity area was designed to resemble a farmhouse kitchen, with a large wooden table, solid dining chairs with contrasting chair pads, kitchen cabinets and shelves. These are familiar and recognisable cues for a welcoming domestic space and encourage interaction at the table with the staff and between patients. 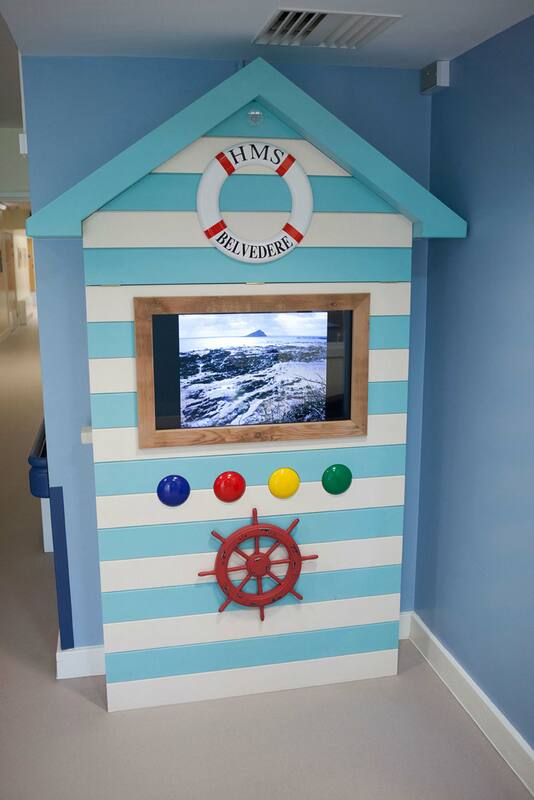 We worked closely with Carrie Clarke, the ward Occupational Therapist to add fun and engaging interactives that enabled patients to explore audio and visual stimuli. 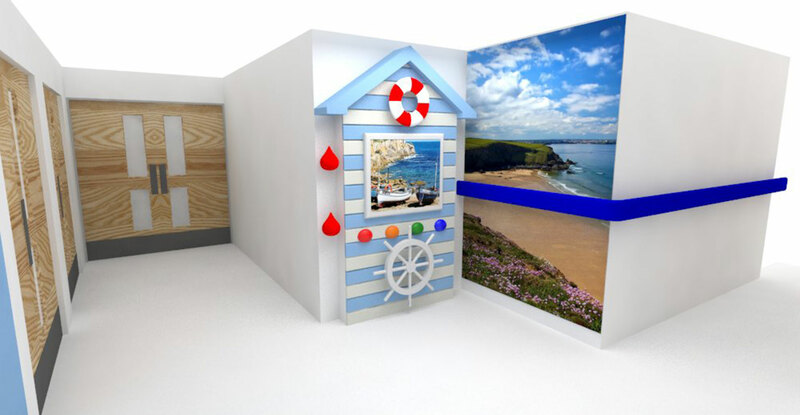 We designed a ‘beach hut’ that played sounds on pressing large buttons, and contains a screen showing relaxing coastal images on a loop (that can be updated and refreshed). The domestic feel has definitely enhanced the relationships and social activities within the ward. It seems patients are empowered by the visual cues to move about the space and join in more often. Unexpectedly, the kitchen table has provided an alternative place for eating meals, which has been particularly helpful for those who find the dining room overwhelming. Staff have found this has improved the food and fluid intake of some patients. “The farmhouse table has been wonderful, we’ve been playing games around it, and more people have come over and joined in. 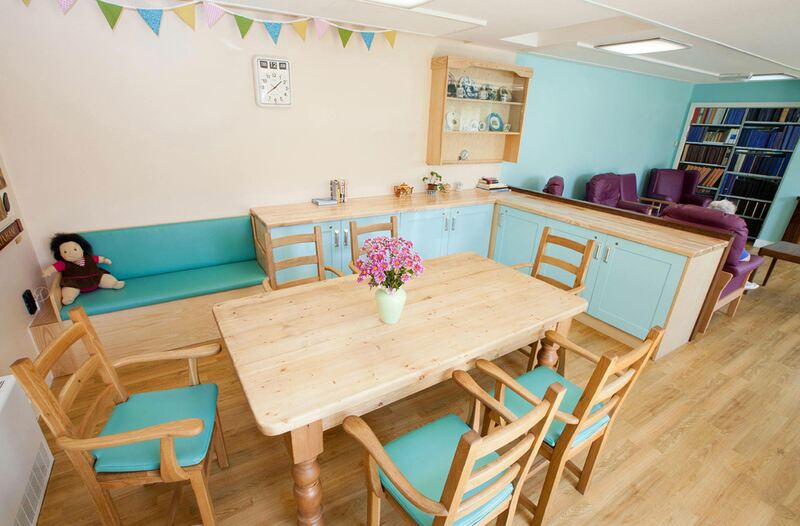 It feels like your kitchen table at home – the hub of everything – everyone gathered around the table enjoying each others’ company.” Staff Nurse Wendy McCoy.